Help join the fight. With our Pink Ribbon Banking credit card and checking account, Bank of America will make contributions to help Susan G. Komen® in the mission to end breast cancer. These contributions will help save lives, ensure quality of care for all and support the essential science and research that furthers the fight against breast cancer. Every purchase you make benefits Susan G. Komen® — at no additional expense to you. Earn 3% and 2% cash back on the first $2,500 in combine choice category / grocery store / wholesale club purchases each quarter, then earn 1%. Open a qualifying Pink Ribbon checking account offered by Bank of America today and a contribution will be made to Susan G. Komen®. 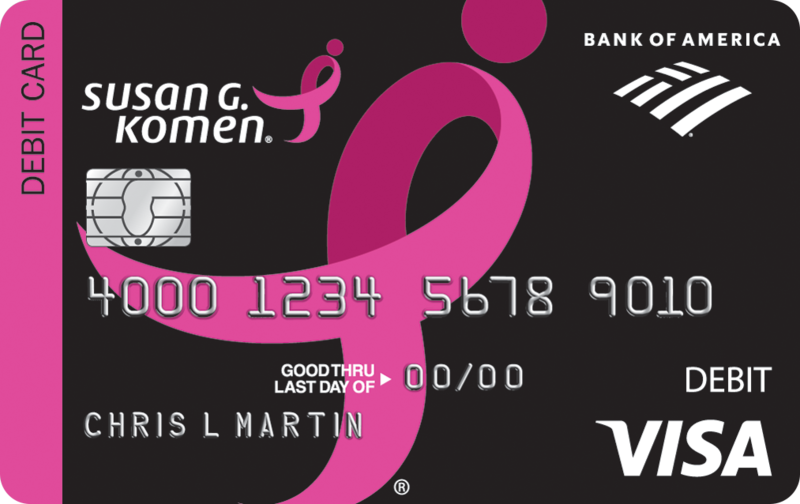 You'll get statements and debit cards with the Susan G. Komen® logo printed on them. Please note that only new Pink Ribbon Banking customers are eligible to help generate a Bank of America® contribution to Komen. From June 2015 through December 2020, Bank of America guaranteed to Susan G. Komen® $3 million in conjunction with its Pink Ribbon program. Susan G. Komen® has received more than $9.5 million from Bank of America from this program since 2009. 1For information about rates, fees, other costs and benefits associated with the use of this credit card, click on Apply now & Join the mission and refer to the disclosures accompanying the online credit application. 2Pink Ribbon Banking is available with eligible checking accounts. 3For each new Susan G. Komen Cash Rewards credit card from Bank of America that is used to make a transaction within, and remains open for, the first 90 days of account opening, Komen receives at least $3 and 0.08% of all purchases (less returns) made with the card. 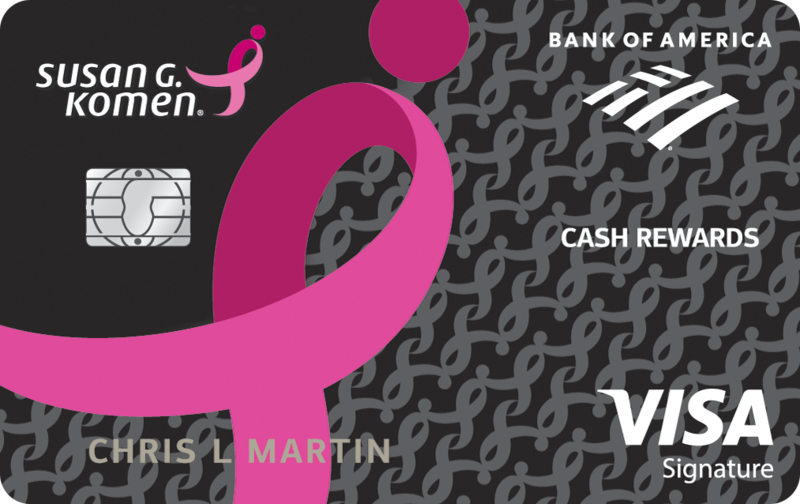 Komen also receives $3 for each renewal of a card that is open with active charging privileges during the 12 month period and does not have a zero balance at the time of the renewal. The Running Ribbon is a registered trademark for Susan G. Komen®. This credit card program is issued and administered by Bank of America, N.A. Deposit products and services are provided by Bank of America, N.A., and affiliated banks, Members FDIC and wholly owned subsidiaries of Bank of America Corporation. Visa and Visa Signature are registered trademarks of Visa International Incorporated and are used by the issuer pursuant to license. "Be More Than Pink" is a trademark and Bank of America and the Bank of America logo are registered trademarks of Bank of America Corporation. To return to the previous page, simply click the Return to Previous Page button.